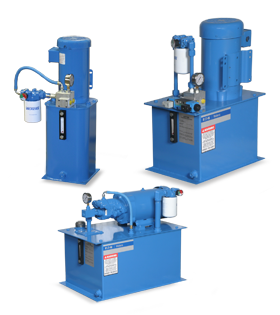 Eaton hydraulic power units are built with quality Eaton components. Available in different capacities, controls, manifolds, pumps and configurations, they ensure reliable, cost-effective operation and maximum productivity in applications from process manufacturing to alternative energy. Select Paks & Centers, Vane & Piston Pumps, 1.5 GPM - 10 GPM, 5-30 Gallon Reservoirs and 3-10 HP Electric Motors are in-stock for Same Day Shipping! For product selection and application questions please visit Eaton PowerSource or contact your Eaton customer service representative. or contact your Eaton CSR.